The true shoulder muscles are the ones on the points of the shoulders which cover the shoulder-joint. These muscles are called the "deltoids" because they are triangular shaped like the Greek letter Delta ((). The base of the triangle is fastened to the bones which form the shoulder-girdle, and the point of the muscle is attached to the bone of the upper arm. When the muscle contracts it lifts the arm outwards and upwards. The anterior (forward) set of fibres (that is, the fibres nearest the collar bone) lift the arm forwards and upwards; the lateral muscle-fibres lift the arms sideways and upwards, and the posterior fibres lift it backwards and upwards. The posterior fibres are brought into active play when you lift a kettle-bell, as in Fig. 49, and that exercise, which develops the latissimus muscle, also develops the back of your deltoid muscles. 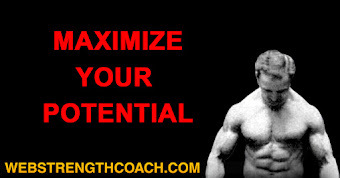 Any time that you lift and object above your head you are giving your deltoids very vigorous work. In light-exercise courses the pupil is told to take a 5-lb. dumbbell in each hand; to stand with the arms hanging at the sides, and then raise the arms until they are level with the shoulders. Part of the time he is to lift the arms straight out in front of him, but most of the time he raises them sideways. 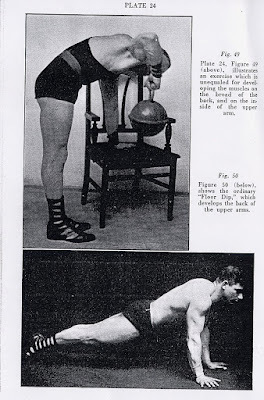 These two movements leave the back of the deltoids untouched, and I think it was Prof. Barker who suggested that the body be inclined forward from the hips before lifting the bells sideways. This variation brings more of the muscle into play. The deltoids are so powerful that it takes more than 5-lb. weights to develop them. For some reason or other straight-arm raising is one of the most exhausting of all exercises, and when you use 10, 15, or 20 lbs. the work of raising the arms from the hang to the horizontal position is very tiring. A much easier way to develop the deltoids is to practice lifting moderately heavy dumbbells or bar-bells to arms' length above the head; and if you use a dumbbell in a certain way you can get a most beautiful development of the deltoids. 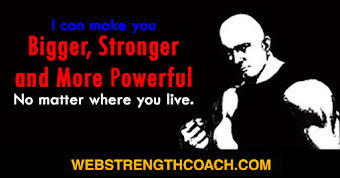 Ninety-nine men out of a hundred have the idea that when a "Strong Man" pushes a big dumbbell overhead the work is done entirely by the muscles of the upper arm, forgetting that, while the triceps muscles on the back of the upper arm will straighten the arm after it is bent, the actual work of raising the arm above the head is done by the deltoids. 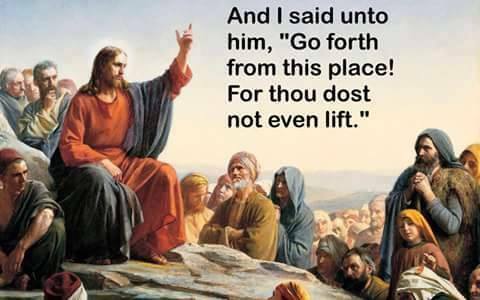 This explains why so many men with fine upper arms fail utterly when they try to push aloft even a moderately heavy weight. Every one of you is familiar with what we call the "floor-dip," where the athlete first assumes the position shown in Fig. 50, and while keeping his body rigidly straight, raises and lowers it by bending and straightening the arms. The average physical culturist, who can do this only three or four times when he first learns it, becomes able in a few months' practice to repeat it 30, 40, or even 50 times. By so doing he gets a fair development of the outer head of the triceps muscle, and a good development of the pectoral muscles on the breast, but hardly any development of the deltoids on the shoulders. When he is asked to take a 75-lb. dumbbell in his right hand and raise it to arms' length above the head he can't even start it on its upward journey away from the shoulder, and this puzzles him very much, because he knows that his upper arms are strong. He is still more surprised if he sees a workman, who has been accustomed to using a pick and shovel, push the dumbbell up fairly easily - especially if that workman happens to have an upper arm smaller than his own. The explanation is that every time the workman raises a pick-ax above his head he uses his deltoids, and every time he scoops up a shovelful of dirt and chucks that dirt onto a high pile, it is his deltoids which lift his arms. I hope eventually to convince you that his upper-arm muscles are the last thing a "Strong Man" worries about. He knows that if he fully develops the deltoids and the muscles on the upper body which control the movement of the whole arm, and if he develops the wrist and forearm to the full, his upper arm muscles will develop almost of their own accord, and will be equal to any demand he can put upon them. If you take a moderately heavy bar-bell in your two hands, stand with your feet apart and well braced, keep your body upright, and push the bar-bell to arms' length several times in succession, as in Fig. 51, you will develop the triceps and deltoid muscles at the same time; but you will get more effect in the shoulder muscles than in the arm muscles. No one of you should go anywhere near the limit of your arm strength in this exercise until you have strengthened the lower back by practicing the exercises in Chapter II. An easier way to develop the deltoids is to use a pair of kettle-bells and to push the arms aloft one at a time, as in Fig. 52. As you raise the right arm you should lower the left arm, and at the completion of the movement, after the right arm has been straightened, you should reach up with the right shoulder and reach down as far as possible with the left elbow. 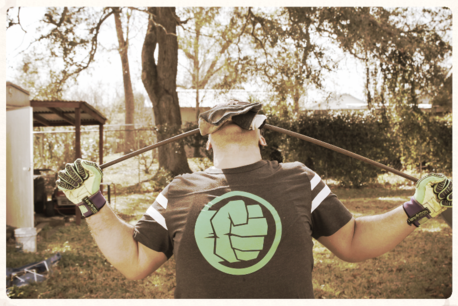 When the left arm goes up and straightens you reach up with the left shoulder and down with the right elbow. This little extra motion at the end of the lift will add greatly to the strength and development of the shoulder muscles, and should not be omitted. If you start with 15 lbs. in each hand you can quickly work up until it is easy to do it with 40 lbs. in each hand. I have seen a professional start his work out by doing this exercise with 75 lbs. in each hand; and he did it not as a feat of strength but just as an exercise to warm up the shoulder muscles. There is another and even better way of using a dumbbell for shoulder and upper back development. (The two things cannot be separated.) In your upper arm the biceps-flexor bends the arm, and it is opposed by the triceps which straightens or extends the arm. The deltoids and some of the back muscles oppose each other in the same way, and when you find a man with big, rounded muscles on the points of his shoulders you almost invariably find that that man has an equally remarkable development of the muscles of the upper back and broad of the back. (By the way, in our line of business the broad of the back does not mean the widest part of the back between the shoulders. The small of the back is that part of your back at your waist-line. The broad of the back is where the back starts, just above the waist, and spreads out to the arm pits. That part of the back above the arm pits is always alluded to as the shoulders, or the upper back.) There is a great deal of difference between being broad backed and broad shouldered. A man with a big frame, but no muscular development, can have broad shoulders and yet, owing to lack of muscular development, be narrow in the broad of the back. The following exercise develops both shoulder and back muscles. Take a 25-lb. dumbbell and lift it to your shoulder. Step forward with the left foot, which makes you stand about as in Fig. 53. Rest most of your weight on that advanced left foot; lean your body over in the direction to which the left toes point, and as you lean over push the bell to arm's length with the right arm. Straighten up, and, as you do so, lower the right arm slowly, so that when the arm is down the hand holding the bell will be just opposite the shoulder and about 8 inches away from the shoulder, as in Fig. 54. The arm must be lowered slowly. And as it is lowered you must deliberately harden the muscles on the right side of the upper back, so that the horizontal right upper arm will be supported on a shelf of muscle. If you get the trick correctly you will find that all you have to do is to again bear your weight on your left foot, bend your body over and the bell will go up almost of its own accord. You should use a bell of such a weight that you can repeat the movement ten or twelve times. All the benefit comes from the way you do the exercise, and the weight used is of less importance. It is folly to use a 5- or 10-lb. dumbbell, because so little weight would throw no "developing strain" on the muscles. It is just as much of a mistake to use a bell which requires all your strength to put it aloft. If you think this is a "lift" and waste your time in seeing how much weight you can push to arm's length, the development you get will be very disappointing. If you use a moderate weight and do the exercise correctly you will get simply wonderful shoulder and back muscles. The back muscles are developed through the act of contracting them as you lower the arm. The deltoid is developed by the act of raising the bell, but even more by the way you lower the bell. In Fig. 54 the hand holding the bell is almost halfway to the muscled-out position. Practically every man can start with 25, 30, or 35 lbs. This movement develops the muscles so rapidly that it is possible to increase the weight of the bell a couple of pounds per week. If you are a light man 50 lbs. should be your limit; if you are a big man you can go as high as 65 lbs., but you must always keep firmly fixed in your head the idea that this is a developing exercise and is not a lift in any sense of the word. No man could make a big one-arm lift in this style, although it is almost the best possible training for some of the muscles used in overhead lifting. Look at any illustrated book written by those travelers who have visited South Africa, the South Sea Islands or other parts of the globe where the natives wear by few clothes. In the photographs showing the natives you will see that all of the men have quite large pectoral or breast muscles, even though they show by little development in the arms. I have never been able to satisfactorily account for such development, because in civilized lands the only men who show that development are gymnasts. These same muscles are distinctly outlined in the old Greek statues. Some of the great "Strong Men" have highly developed pectoral muscles, but these muscles are not particularly noticeable, because they are accompanied by equal development in the neighboring part of the body. At present there seems to be a cult among physical culturists for development of the breast muscles. 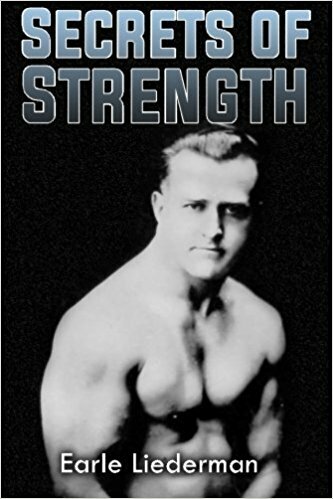 If you will turn to the various pictures of celebrated "Strong Men" which appear in this volume you will not find one man who shows anything abnormal in the way of breast-muscle development. If a man has big muscles on the upper front chest and little development elsewhere, naturally, these muscles will appear abnormally large, but if the shoulders are wide, the deltoids well developed, and the arms covered with muscle, then the pectorals don't seem nearly so big. In the picture of Sandow, Fig. 55, you can see pair of pectorals just as big as those of the average Zulu, but you don't notice these muscles unless you look for them, because they harmonize with the rest of his development. These pectoral muscles are not nearly as important as some of you think they are. 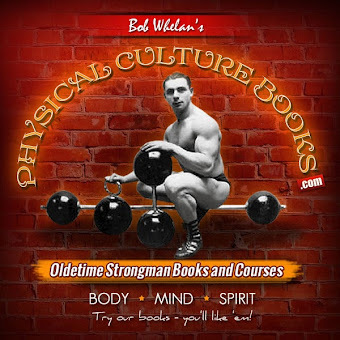 Anyone who has spent a lot of time at the "floor dip" or "dipping" on the parallel bars, or who did Roman-ring work, is bound to have highly developed pectoral muscles, but the finest pectorals I ever saw on any man were on a weight-lifter who rarely practiced dipping. If he did the floor-dip at all he did it with his arms straight, holding them stretched out beyond the head or straight out to the sides. When you do the floor-dip with the arms straight, the chest can be raised only a few inches from the floor, and the work of raising the body is done by the muscles which control the arms. The pectorals get the hardest work in that variation of the floor-dip when the arms are stretched straight out to the sides. The lifter in question, instead of doing the floor-dip, would lie flat on his back with a 40-lb. dumbbell in each hand (Fig. 56), and spread his arms out to the sides, and while keeping the arms stiff and straight bring the hands together by lifting the arms. Few people can do this with 40 lbs., and 20 lbs. is enough for the average beginner to use at the start. The pectoral muscles are not nearly as important as the muscles on the back, although they should not be neglected. It is a fatal mistake to try to increase the size of the chest just by thickening the pectoral muscles. Those muscles are fastened to the breast-bone at one side and to the upper arm bone at the other, and so their tendency is to pull the shoulders forward and closer to the breast-bone; which explains why some of these parallel-bar specialists have become permanently round shouldered. Development on the front part of the chest must be balanced by even greater development on the upper back. This is another case where the mirror is to blame. The beginner will work like mad to develop the chest muscles, because he can see them in his mirror, just the same way that he develops the muscles on his abdomen and on the front and outside of his thighs. Because he cannot examine them with ease he neglects the far more important muscles on the upper back, the small of the back and the back of the legs. Man is an upright animal, and one of the main objects of training is to make the individual as upright as possible. When you find a man who is possessed of super-strength, you find a man who is as "straight as an arrow." All the muscles on the upper trunk, the pectorals, the deltoids, and the muscles across the back of the shoulders can be quickly and easily developed by what is called "straight-arm work," because when the arm is held straight all that the muscles on the upper arm do is to keep the arm in alignment, and the arm as a whole is moved to various directions by the contraction of the muscles which have their origin and base on the bones of the upper part of the trunk, and their attachments on the upper arm bone. The exercise in Fig. 42 develops the back muscles, because the arms are held straight as you lift the bell. In the ordinary shoulder exercise the arms are likewise held straight, and the same thing is true of the chest exercise, Fig. 56. One of the greatest strength stunts on a pair of Roman rings is for the athlete to hold himself in the position known as "the cross," with one ring in each hand, the arms held straight out to the sides and the body upright. This is possible only for those men who have great strength in the upper body muscles. It is not hard to keep the arms straight, but it requires a great exertion to keep the body from immediately falling down so that the athlete is hanging by the hands. To maintain the "cross" position it is necessary to press downwards against the rings, and if you have read the text carefully up to this point I do not have to tell you that the muscles which enable you to press down with the hands are the ones on the broad of the back. (A lesser working strain is thrown on the deltoids and the pectorals.) This stunt is easy for a man with a powerful upper body and small lower limbs, while it is very difficult for a big 200-lb. man who is fully developed from head to foot. A man who can do "the cross" on the rings may be able to "muscle-out" quite a heavy weight in each hand, although it is quite likely that he cannot muscle-out an even heavier weight in one hand. Fig. 57 shows what the English lifters call "the crucifix lift," and which the European lifters call "holding in the balance." One of the most popular of all strength tests is to hold a weight straight out from the shoulder in one hand; and it is a common thing to see a group of workmen or athletes in an impromptu competition with the object of seeing which one of them can "muscle-out" the heaviest weight. In some parts of the country they allude to this stunt as "off-arming." No matter what you call it, it is a fine test of strength, because anyone can do it without practice, there being little skill required. The proper way to "muscle-out" a weight is the European style, where you hold the weight by the ring with the knuckles of the hand up. You can do more if you hold the bell straight out in front of you, and while the athlete is allowed to advance one foot he is forbidden to lean back from the waist. If the average man does 25 lbs. in this style he is lucky. Any man who has practiced lifting bar-bells overhead has thereby developed such strength that he can muscle-out 40 or 50 lbs. at the first attempt. Bodily weight is a decided advantage and most of the records are held by big men. In France and Belgium, where this stunt is very popular, there are a number of athletes who have muscled-out between 80 and 90 lbs., but the record (112 pounds) was made by a German named Michael Meyer. 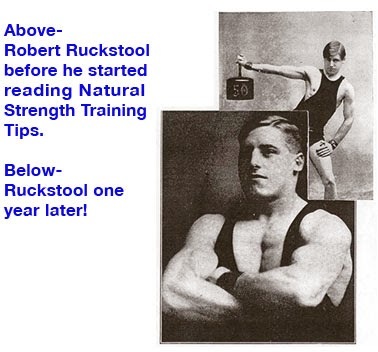 (The old-timer, Carl Abs, is unofficially credited with 110 lbs.) Under the European rules the lifter does not raise the weight with a straight arm, but he lifts it with a bent arm until the weight is hanging right in front of the left shoulder, as in Fig. 58. Then he extends the right arm which holds the weight straight out in front of him, as in Fig. 59. When doing this stunt with a really heavy weight, there is an almost irresistible tendency to lean back from the waist in order to balance the weight; and this must be avoided, because as soon as you lean back, while your arm may be horizontal, it is no longer perpendicular to your body; whereas if you stand upright the body and arm are at right angles. If you and your friends have every tried holding out a weight it is probably that you pushed the weight to arms' length over the head and then lowered the arm to the side with the weight resting on the palm of the hand, which is a perfectly admissible style, providing you keep the body upright and have the arm absolutely straight. A bunch of young huskies who are not acquainted with the rules are apt to hold the lifting arm slightly bent at the elbow, and to lean the body to the side in an effort to balance the weight, as in Fig. 60. In this lift the correct style is shown in Fig. 61. I have never seen more than 85 lbs. held out correctly at the side in one hand, although I have seen an athlete hold out correctly 80 lbs. in each hand. 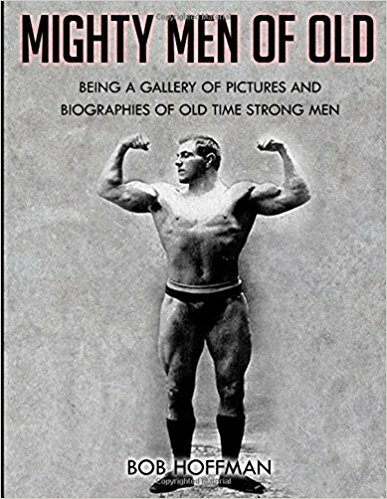 (There is a legend to the effect that the gigantic Louis Cyr once muscled-out a 135-lb. dumbbell; but I am quite sure that if this is true he must have broken the rules.) When you do muscle-out a bell to the side with the palm up, you're apt to feel a sharp pain at the lower end of the biceps, right on the inside of the elbow-joint; whereas if you're holding a weight out in front with the knuckles up there is no pain whatever. Holding out one weight in each hand is in some ways easier than holding out a weight in one hand, because the two weights balance each other, and that is especially true if an illegal style is used. To take a 65-lb. dumbbell in each hand, "curl" the weight to the shoulders, push them aloft and then lower them with absolutely straight arms, as the position shown in Fig. 57, is a feat which requires tremendous strength in the arms and shoulders. 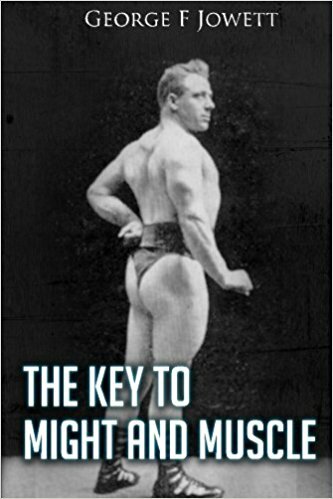 Hackenschmidt is said to have done this with 90 lbs. in the right hand and 89 lbs. in the left hand, and the Russian lifter, Khryloff, did it with 90 lbs. in each hand; and Khryloff, if I can judge by his pictures, has the most magnificent-looking arm on record. There is an illegal method in which after the weights have been pushed aloft the arms are bent slightly at the elbow, and then the hands are lowered outwards until they are level with the top of the head. While holding the bells in this position the lifter bends his body backwards at the waist and rotates the hands until the palms are pointing to the rear of him. In this attitude the arm and shoulder muscles are "locked" in a sort of mechanical way, and because the lifter is leaning so far backwards a spectator standing in front of him gets the impression that the bells have been lowered as far as the shoulder-level. In 1916 I saw a 145-lb. wrestler take in his right hand an 81-lb. dumbbell, and in the left hand a 79-lb. dumbbell, and do this stunt so cleverly that some of the spectators thought he was making an actual crucifix lift. This particular athlete had trained for years with bar-bells and was very clever in handling them. His flesh was of an extremely tough variety and he was almost insensible to pain; which was a good thing, because otherwise he could not have borne the strain of holding out the weights in the way he did. The two bells together weighed 15 lbs. more than he did himself; whereas no man had ever been able to properly hold out two dumbbells whose combined weight equaled his own. I doubt whether this man could have correctly held out more than 55 lbs. in each hand. The act of holding bells at arms' length; that is, of "muscling them out," is a feat of super-strength or a test of super-strength, but not a developing exercise. The exercises in the first part of this chapter, where you raise a weight, develop the shoulder strength which will enable you to "muscle-out" big weights.